In this article, we will see how we can extend spring classes to include our own hook at each important event of the flow during the loading of definition. At each event we add some information to a list which we will print at the end of execution.We will also examine the flow and see how spring has group them into appropriate concerns. This will help you if you want to extend spring framework and make it work for your own use cases. 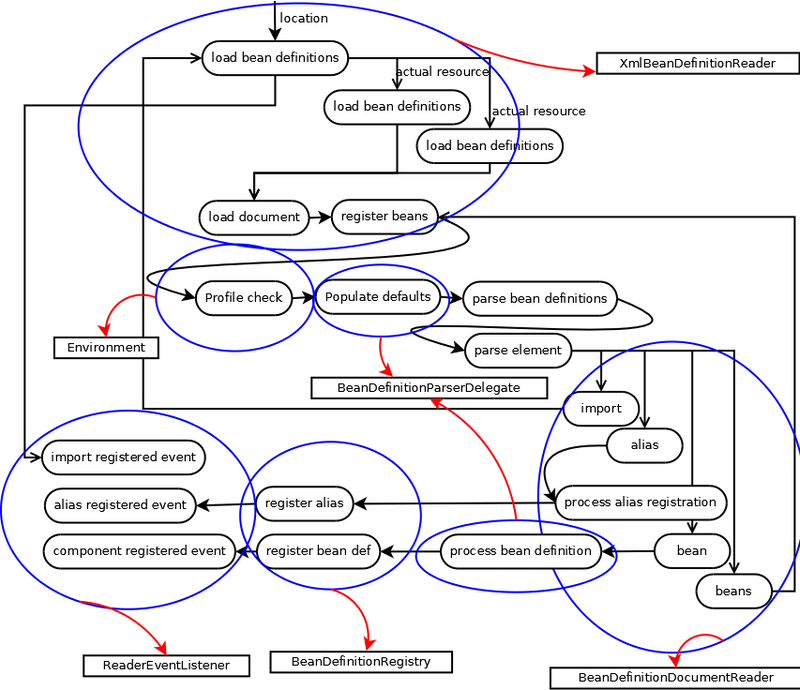 If you want to know the basic flow of loading bean definitions, read here. XmlBeanDefinitionReader drives the outer flow. It helps to locate the actual resources based on the location pattern. We will sub class the xml reader and override the methods that load bean definitions. This way we will know the actual location paths of the resources. We will also set our own event listener. It will be notified as and when the main elements import, alias, beans, bean are read. Next, we set our own environment so we know when the profile is validated. In the unit test, we use our own xml reader to load the bean definitions. We also set the sub-classed event listener and environment to the reader. Finally, we print all the list of events that we populated at each occurrence of the event starting from loading to registration of beans. When we run the above test, we get lot of output!. You can tweak the above classes to log information as per your own interest. In the below diagram, we group the actions into different concerns. Each concern is handled by a dedicated class.